June 19, 2015. 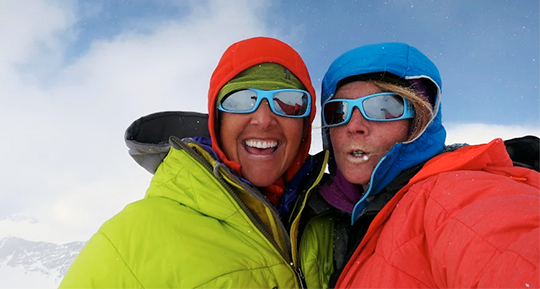 On day five of a planned three-day ascent of the Denali Diamond, Chantel Astorga and Jewell Lund cramponed up steep snow slopes toward the Cassin Ridge leading to the summit. Out of food and hungry, they'd just ascended 3,800 feet of sustained mixed climbing up steep rock. Then they spotted a stuff sack sticking out of the snow. "It had this horrendous-looking freeze-dried food in it," Astorga told Alpinist. "We cooked it up. It tasted like wood, horrible, but it filled my belly and I was stoked." Energized, they continued on, reaching the top of Denali (20,237') after four-and-a-half days of climbing. 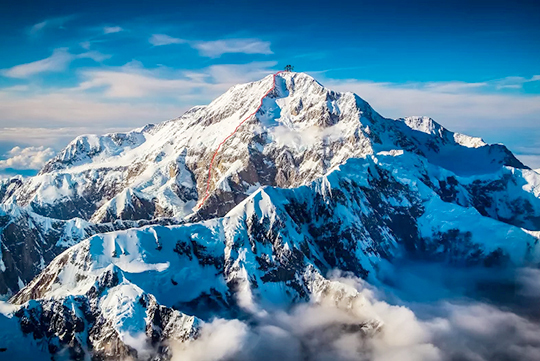 Their ascent marks the first time the Denali Diamond has been climbed by a female team and it's probably the first time an Alaska Grade 6 route, a route with sustained hard climbing and a high level of commitment above 14,000 feet, has been climbed by a woman's team on Denali. Chantel Astorga, an avalanche forecaster from Lowman, Idaho, and Jewell Lund, a coffee roaster from Salt Lake City, Utah, flew into base camp below Denali in the Alaska Range on May 26 and spent a couple weeks at 14,000 feet on the West Buttress acclimating and waiting for the weather to stabilize. When conditions improved, the women climbed to 16,000 feet on the West Rib, then descended to the Seattle Ramp which led to the base of their objective—the Denali Diamond on the sunny southwest face of Denali between the Cassin Ridge and the Roberts-McCartney route to the left. The storied Denali Diamond (Alaska Grade 6, 5.9 A3/M6 A1 WI5+, 7,800'; FFA M7/M7+ Amano-Masumoto-Nagato, 2010) has become the mountain's modern classic in the last decade. Colin Haley, who made the fifth ascent in June 2007 with Mark Westman (in 45 hours, 45 minutes), said in the NewsWire Denali Diamond: The New Cassin? that "The climbing...certainly deserves such status. I won't be surprised at all if it...becomes the classic hard route on Denali." The Denali Diamond was first climbed by Colorado climber Bryan Becker and Rolf Graage, a guided client who wanted to get Alaskan big mountain experience, from May 24 to June 10, 1983. Becker wrote in the 1984 American Alpine Journal, "When we set out, the rangers thought we had no chance and indicated that if completed, the line would be one of the most difficult routes ever done on [Denali]." While the pair spent 17 days on the route, they climbed on only nine. Becker stated, "On the other eight we were pinned down in our fourth and fifth bivouacs near the top of the rock wall by raging winds and spin-drift avalanches." With a limited rack and a single rope (Graage forgot the second rope), it was impractical to retreat so the two pressed upward expecting to find easier climbing. Instead they found the hardest climbing on the route, spending two days finishing the last two-and-a-half pitches. After climbing 38 pitches, doing hard ice and rock climbing including an A3 lead over a 25-foot roof, surviving frostbite and frigid bivouacs, Becker, leaving Graage at a trench bivy with frostbitten feet atop the Cassin Ridge, reached the summit alone and in tears. "Though the quality of the climbing was superb, Denali gave us a thrashing I shall never forget," he wrote. The route didn't see a second ascent for almost twenty years when Kenton Cool and Ian Parnell climbed it in five days in 2002. The Diamond saw four other ascents in the next few years: Fumitaka Ichimura and Katsutaka Yokoyama in 2005; Chris Brazeau and Ian Welsted in 2005; Colin Haley and Mark Westman in 2007; and Japan's Giri Giri Boys—Kazuaki Amano, Ryo Masumoto and Takaai Nagato—who made the first free ascent of the 8,500-foot route in 2010. 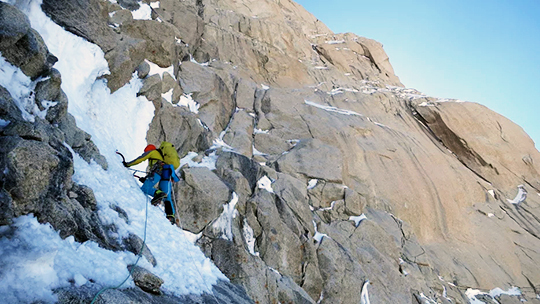 To prepare, Astorga and Lund completed the second ascent of Polarchrome (5.9+ WI5+, 3,300', Rohn-Haberl, 1984) on Mt. Huntington (12,240'). "Polarchrome was a total treat," says Lund. "The cool thing about that route is that we had no info on it. [The route] allowed us to go into something unknown and test our partnership." Astorga, who guided on Denali from 2008 to 2011, was first inspired by the Denali Diamond five years ago, but lacked the partner to attempt it until she climbed with Lund. Before committing, Lund checked out the route. "I looked it up and read about the A3 terrible roof and I thought 'Who is this Chantel?' and 'Why is she wanting to do this?'" she recalls. "But after we climbed on Huntington last year it felt like a good fit." The two teamed up for the first time last year. "I'm surprised that already my favorite ventures in the mountains have been with her," she says. "We move well together, and I've never had such good company when climbing past the 24-hour mark." The pair began climbing in the middle of the night on June 15, under mostly clear, calm skies. They simul-climbed the first seven pitches and then swapped leads. Astorga says, "We started out on a 30-hour push, then we had to stop for six hours because everything was running with water." However, they couldn't hack out a bivouac spot on blue ice ramps and kept climbing until 6 a.m. Finally, "we pulled over and chopped out a 1 x 3-foot rectangle and did a sitting bivy for two hours." Then they continued on until they found a suitable ledge, chopped out a bivy spot and erected a small tent. "Since we had a good forecast," notes Astorga, "we spent the rest of the afternoon and night sleeping." They rose at 10 a.m. the following day and then did another 30-hour push up the face, up the hardest climbing on the route, to reach the Cassin Ridge. Astorga says, "The hard climbing is a steep dihedral with sustained pitches. It starts off with a thin, stemming section, led by Jewell, followed by blocky, loose rock climbing pitches. Then you hit the crux, M6 A1 [or M7/M7+ if climbed without aid-Ed. ], which is an overhanging rock pitch. The pitches leading up to it and after it felt as hard if not harder. I'd put my front points into the crack or smear on these tiny dishes of granite and test to see if the crampon would stay [which they did]." The rock quality was excellent, "nice golden granite" says Astorga. The climbers found, like most of the previous ascents, that the upper pitches had thin ice and rock instead of thick ice flows. That was especially true this season with May and June's dry and cold weather. Astorga says, "It was delicate, tip of the pick." Regarding their extended pushes, Lund says, "We were checking in on each other's mental state. But if we had felt unsafe, we'd say something. You never like to get that tired, but we've been in that state before and understand how our bodies respond to it." 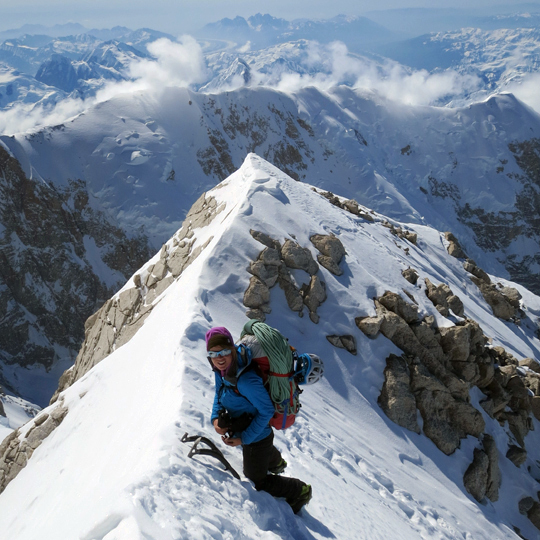 The women agree that Denali Diamond is one of their favorite climbs. Astorga says, "The route was amazing and we're stoked we got to do it. It's the best adventure I've been on for sure." Lund echoes that thought, "It's one of the most beautiful routes—I've never done a route with so many technical and fantastic pitches." Beautiful climb and a stunning line. Way to go ladies!!! Dames on the Denali Diamond! just awesome. proud send, chantel and jewell!